This was our first trip to the Orient - I got a pass from Northwest Airlines Sales - First Class cost us $120 plus $3 tax. The cost for Coach would have been $85 plus $3 tax. Who in their right mind wouldn't pay the additional $35-we are talking about 7 flight segments so $5 each to upgrade. Sure was a tough decision. We flew NW flight 7 JFK-SEA-HND (Tokyo Haneda as Narita had not been built yet) Then on to Taipei and Hong Kong. The return was HKG-HND-SEA. We spend couple of day in Seattle on the return, climbing Mr Rainer (by car). Then NW 4 SEA-JFK. All 747's! As a member of management at Pan Am, I was afforded unlimited free first class travel, on a space-available basis. I have flown on more than 125 international first class flights throughout the world on Pan Am in my four years with this great airline. It has been called the “golden age” of air travel, and for good reason. I had experienced some great first class service on other international airlines prior to joining Pan Am in 1980, but Pan Am was the crème de la crème. Flying for me was and still is an experience unto itself, a major component of any trip, and not just a means of transportation. The journey means as much as the destination-it is a celebration of flight and travel. The key to great service began with the flight attendants, or stewardesses (this was an acceptable term), who were head and shoulders above their counterparts on other airlines. Safety was paramount, and a rigorous training program was conducted in a mock up aircraft cabin, exactly like the cabin of a 747. All possible emergency contingencies were covered, including evacuating a full aircraft in 90 seconds, rapid decompression, smoke in the cabin, hijacking, medical emergencies, deploying the exit slides, and even inflating the aircraft raft in a swimming pool and getting others in were all required to be certified as a flight attendant. Safety was even more critical back in the 70’s and 80’s, because even though flying was relatively safe, there were more incidents and accidents back then. Service was paramount for international passengers and Pan Am crews were exceptional at meeting the higher expectations of the international dignitaries, politicians, corporate executives, and jet-setters on board-a very sophisticated and difficult group to please, but Pan Am provided service with a professional, dignified yet friendly approach. Grooming and appearance were a major factor in being hired, with make-up, hosiery, gait and weight all considered. A typical applicant had to speak a second language fluently, and be measured for ‘bone caliper” to determine appropriate weight. A typical 5’, 5” woman was required to weight less than 125 pounds, and if small framed, 114 pounds, including clothes! A walk in front of the interviewer to assess gait and posture was required. Teeth had to be straight and white, and no visible marks or blemishes were allowed. I am not talking hyperbole when I say attractiveness, style and appearance were a critical determinate for the position. The longer haul international flights on Pan Am were mostly operated with spacious 747’s, which curved more narrowly in the front than other aircraft, affording a great view. You could even see partially forward. We loved the beauty outside the aircraft-and it seemed to improve with each drink, or glass of great wine, or champagne, or port, or after dinner drink, all which flowed generously as we raced through the sky to another exotic destination. 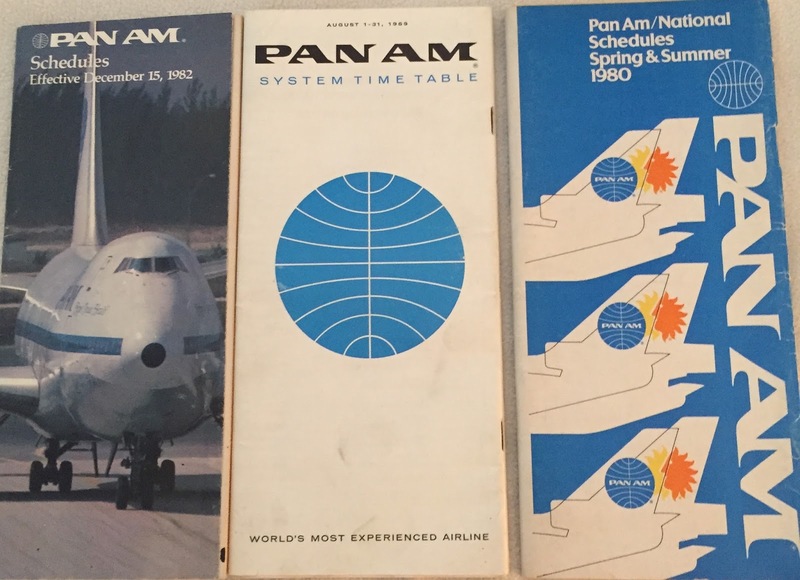 Pan Am had always been the leader and innovator in air service, and many of the service specials that are standard today were novel back in the late 70’s and early 80’s-Improving seat design was one of them. Pan Am came out with the first “Sleeperette Seats” in the air, which were soft and cushy and reclined 60 degrees, making it much easier to sleep. But sleep was not the most important thing on long-haul flights for me, my wife, and my friends John Barrett and Al Brown, who were also Pan Am employees. A fellow traveler called the experience “insanely indulgent” and I couldn’t agree more with her assessment. I often wondered how much money the bartender at the Clipper Club made in a year. He was very outgoing, people were usually in a good mood traveling, and he often remembered names and the places people had been or were going, and he could spin a good tale. Since drinks were complimentary, most everyone gave him a tip. There was even a bit of a competition to see who would tip more. The businessman would throw him a 5-dollar bill, then a celebrity a 10-dollar bill, then a sheik a 20-dollar bill, then we would give him four quarters-hey, we were airline employees, we didn’t get paid much. But we were always in a great mood rubbing elbows with this elite crowd about to board a luxurious 747 to Europe or Asia or South America with Dom Perignon, Chateaux Margot, and Chateaubriand awaiting us. Of course, First Class would be boarded ahead of business class and coach, and since the 747 was so big, you would board at separate doors. We would board on the jet bridge to the left. It is always an exciting moment turning left on an airplane-avoid turning right at all costs! You were greeted at the door by an attractive flight attendant (of appropriate height, weight and gait), and personally escorted to your seat; your coat or jacket was hung up for you in a separate closet. On your seat was a large pillow and comfortable blanket. Prior to pushback they offered you a pre-flight drink of champagne, such as Krug Grande Cuvee, one of my favorites, or orange juice, or a combination of both, a Mimosa. This was followed by a choice of magazines and newspapers, both local and ones from your destination. After this, a fancy menu was handed out which included details about the elaborate meal service for the entire flight including beverages and drinks. On the cover was a different Pan Am destination drawn by a famous artist, or a special select flight from days past. Most international flights had multiple meals served. You were then given a nice amenities kit specifically designed for either man or woman, with fine toiletries, shaving items, towels and an eye-mask for sleep. This was prior to the noise-canceling technology, but the earphones at your seat had large cups and were the best quality for the time. Soothing music was played during your time on the ground. Upon request, there was Pan Am logoed stationary and Pan Am flight themed playing cards and post cards, which could be written and handed to your flight attendant for mailing at your destination. As the engines were started and you taxied away from the gate, the 747 afforded a great panoramic type view of the airport, the tarmac , the taxiways and runways, as well as other planes To this day, no other plane affords this type of spectacular view. Not even the bigger AB380 can make such a claim. The 747 is the only commercial aircraft where you can be seated forward of the pilots, and in the first row you felt like you were in your own private plane. Seat 1A or 1J is my favorite. 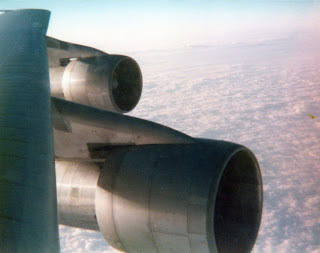 The engines had their own peculiar type of sound due to the higher by-pass engine cowlings and fan blades. This became music to my ears. I have many hours of video of this sound and can still go to sleep by it. But sleep was going to have to wait a few hours now, as the main n-flight service was about to begin. After take off with the plane passing through about 10,000 feet in a smooth climb, drink orders were taken. Sometimes this would be done on the ground, if time allowed. For a seasoned traveler who enjoys the service, next you would hear the clink of glasses and ice, as the drinks were being made-more music to your ears. You would settle in with your drink, which is one of my favorite times as you started to relax on a long-haul flight. The liquors were superb, such as Johnnie Walker Black label Scotch, Stolichnaya Vodka, Fine Bombay gin, or Jack Daniels Black Bourbon. Also popular at the time were Aperitifs such as Sherry, Dubonnet, Compare or Champagne Cocktail. Most passengers at the time would be dressed as if they were at a fine club. It was as if the dress and style of the patrons at Rick’s in Casablanca had been boarded on your 747. Unlike flights today, travelers kept their window shades open to enjoy the view, and this added to the overall ambience of the flight. Premium domestic and international wines were served as requested, usually representative of the countries you were flying between. Chateau Pouilly-Fuisse, Chateau Margoux, or Chateau Latour Martillac were common. With your drink, served in crystal glasses, came warm nuts and an aperitif. The flight attendants were in no rush to serve the seven-course meal; it was to be enjoyed leisurely. And a second drink was offered for those who wanted one. There was no rush to put the tray and linen out, as this was a cocktail hour in the sky, to be enjoyed. Often you would see a glorious sunset if you left in the early evening hours, such as to Europe from the US. And sunsets at 38,000 feet after a few drinks were just that much better than on the ground-sometimes if the sun just set prior to departure you would see it rise and set again as your plane climbed out. Where else can you see the sun set twice in the same day? Maybe in space, but they don’t serve Johnnie Walker Black or Chateaux Margot in space. After at least an hour, it was time to put out the tablecloth and linen. You were given individual crystal salt and peppershakers, bread and butter, as well as a vase with a flower for each passenger. The 747 had tables for two facing each other upstairs if you desired, another Pan Am first. Now was the time to ascend the spiral staircase to the upper deck. It will always be an iconic part of the glory days of travel. Unfortunately, they have been done away with on newer 747 models due to safety concerns, as some passengers, often a little tipsy, or with a little turbulence, would take a more direct route head first down to the lower level. Proper cutlery, fine linen table clothes and napkins were set up with two glasses, one for water and one for wine. 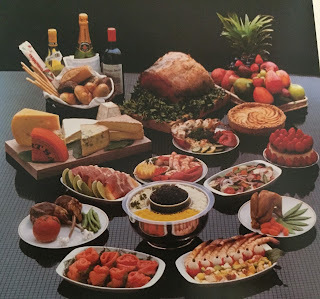 Now came the hors d’oeuvre’s and appetizer service, which in my opinion, is still to this day the best ever in the sky. Back then TWA and Northwest were the main US carrier competition in the international market, and later United, American and National, but there was no comparison. And Pan Am was equal to or better than the real competition of the finest international airlines such as Japan Airlines, Cathay Pacific, Singapore, Swissair, KLM, and British Airways. Better than Qantas, South African, Lufthansa and Air France- and yes I have flown premium first class on all of them–spoiled, spoiled, spoiled. I’m the first one to admit it, but also the first one to appreciate it. The hors d’oeuvre’s were then placed on a large service cart covered with linen, which could be rolled right in front of your seat and table because the large pitch, or distance between seats, was wide enough to allow it. This made the service seem all the more personal. After an appropriate time to enjoy the hors’doerves, a cart was rolled up to your seat, again covered in linen, with a large wooden bowl and wooden spoons to mix your salad. You had a choice of dressing, and could request freshly made caesar salad if you so desired. While all this was going on, you could smell the aroma of the roast being cooked. The Pan Am flight attendants had good ovens to work with on the 747 and could cook the aged beef to perfection, asking how you liked it prepared. As an alternative entrée, you had a choice of fish, such as Norwegian salmon, fillet of sole, or trout, but only if you passed on the lobster thermador. Usually a pasta dish was an alternative main course selection, as well as a local dish from the country you were visiting, such as weinersnitzel from Germany, chicken curry bombay from India, or lamb from New Zealand. If you chose the roast, it would be presented on a cart with a wooden cutting board and carved with an appropriate cutlery knife right in front of you. Traditional accompaniments such as vegetable bouquet, potatoes maison or rice pilaf would accompany your main course, with the appropriate wines. And “Risi e Bisi” another Pan Am special, was a popular rice side dish, long before risotto became popular. Again after adequate time had passed, and timed to the preferred speed of each passenger, the next course was a selection of international cheeses on the cart; brie, camembert, gouda, and aged cheddar, with crackers and fruit. Of course you were offered fine port to go with your cheese. And last but not least, you had a selection of desserts. It might be German black forrest cake or grand marnier Soufflé-how about Pan Am’s famous Cherries Jubilee? And always there was an ice-cream sundae with fruit toppings, hot fudge and fresh whipped cream. On the same dessert cart would be after dinner drinks; grand marnier, kailua, drambuie and fine Cognac VSOP. After that, a choice of coffee, capachinno or tea-maybe you would like to have a Kailua or Grand Marnier in your coffee? Go right ahead, there is no calorie count on these menu items. Is anyone ready for a nice sleep? You can now stretch out on your cushy Sleepertte seat with wool blanket and pillow as the soothing background hum of the engines and slight bounce of the plane lulls you to a pleasant dreamtime, maybe aided by “a little” drink or two. If you must, close your window shades. Today’s travelers seem much too eager to finish or even skip their meal, lower their shades and take out their laptops, watch a movie, or sleep. In my opinion, we have lost some of the elegant ambiance of flying. After a nice sleep, often 6 hours of more, it was time to open your shades to see a spectacular sunrise. Is that the Alps I see or maybe the Himalayas? Sometimes it would be a Brazilian rainforest, or somewhere over the vast Pacific Ocean. After you awakened, on eastbound flights you normally were served breakfast, on westbound, depending on the length of the flight, either a second meal or delicious snack. For breakfast, you could select a continental or full breakfast. You had a choice of juice, fruit, coffee and breakfast breads, a danish, or croissants, followed by a specialty dish such as eggs Florentine or benedict. Often fight attendants would ask you what type of egg dish you desired and prepare it from scratch-no problem, this is Pan Am’s finest service. Flying westbound, on longer haul flights you would get a mid-flight snack of sandwiches with a sweet treat like clotted cream and scones out of the United Kingdom. Clotted cream might kill you, but you would die happy. I had never tasted anything so creamy, mellow and delectable. The first time I ever had it was on a Pan Am London-New York flight. On shorter westbound flights of 7-9 hours this would conclude the meal service, on longer flights such as to Asia, you would be served another meal before landing, not as elaborate as the main meal, but who could eat much more anyway? Usually you would get a pasta dish, maybe a delicious Asian style soup, maybe steak sandwiches with a salad and a glass or two of red wine? You knew it was a great flight when you were disappointed to be landing, but another adventure awaited you, often to a new city, and you also had the return first class flight awaiting you, with service just as good as the outbound flight. They would hold back the business and coach passengers when deplaning, so you would get to customs ahead of the crowd. In some countries you even had a special premium lane to expedite the entry processing. OPEN YOUR WINDOW SHADES AND ENJOY THE FLIGHT! These are my musings about when travel was exciting, entertaining, adventurous and fun. Primarily in the second half of the 20th Century, find stories of the people who ran the business, the antics of travelers from the business world, celebrities who the author has run into, executive’s and VIP’s from around the world. I emphasize airlines and air travel, but nothing is off base if it pertains to the travel world. Let’s share how travel used to be, especially back in the 70’s 80’s and 90’s. There will be many photo’s and videos, stories of adventure traveling the world, and sharing of airline memorabilia, like the 191 airline menu’s I have, videos of flights on Concorde, DC-10’s, photo’s of 707’s, DC-8’s and venue’s all over the world. Unlike today, where you fly in darkened, depressing cabins, we had the window shades open to enjoy the flight and the views of our beautiful world! 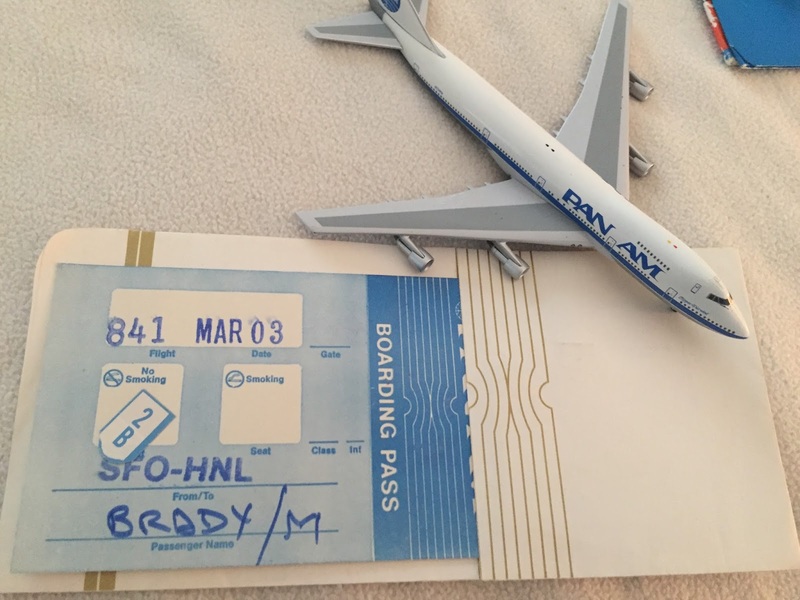 I, Kevin Brady, have a diverse travel background including working for airlines such as Pan American World Airways and National Airlines in the sales and frequent flyer departments, a travel management company in New York handling corporate travel, and managing global financial services travel for over 20 years. I have been on over 1,856 airline flights in my life, which is equivalent to being in the air continuously from January 1 to October 1. I have taken 534 different trips with airline flights - I do not count car/road trips but have taken quite a few of those as well (there is something I don't count). At 38,000 feet you are above 85% of the atmosphere, probably being zapped by all sorts of cosmic, x-ray, and who knows what kind of rays. Add in a little red wine and my wife says this explains a lot about my mental state. I have been lucky enough to travel all over the world, mostly in premium classes such as first/business, when airline management employees were treated like royalty, and when managing airline and other travel vendor contracts like hotels and rental car companies, when they wanted me to experience their best products and services. Someone had to do it! I have also met many celebrities and VIP’s as well as executives in the travel business. I have plenty of great stories to share with all of you who love the travel business as much as I do. I hope to add yours as well as I am putting together information for a book. The word "Emergency" brings a shiver through your body, and a quickening of your heart, no matter what the situation, but especially when heard in-flight. Today, it is common for an airline pilot to fly his whole career without shutting down an engine or making an emergency landing. Racing through the sky at nearly the speed of sound at 40,000 feet with nothing between you and the ground but air certainly strikes an unease in the heart of almost any sane person. It may only lurk in the back of the mind of frequent travelers and pilots, but it's there nonetheless. And for many, it's right up front. I have been in six emergency landings in my life. I define "emergency landing" as a time when fire trucks, ambulances and police cars line the runway, Air Traffic Control has been notified, all airspace is cleared, and the pilot gives a reassuring platitude downplaying any danger - "everything will be fine." Pilots are usually very good at this, but we travelers know better. It's not unlike a Doctor saying, "well, we have some problems here, but don't worry." I like the way the doctor says "we." Emergency landings are so uncommon today that it usually makes the evening news. They were not so unusual in the past, when I was flying frequently. When I sit near the emergency exit and the flight attendant comes by for the safety briefing, I get a chuckle out of the reactions of my fellow travelers and the flight attendant when I tell them that I have been in six emergency landings in my life. Often the first reaction: "get me off this plane!" But I tell them they have it all wrong, I'm good luck, I'm still here after 1,830 flights. Flying today is much safer than it was even 10-20 years ago. My last emergency landing was in December, 1991. I won't exaggerate the emergency landings as if I was on the brink of death each time. I think the word "hyperbole" was specifically developed for how the media handles airline "events." Even the simplest precautionary landings are made into harrowing tales of near death experiences. After my last emergency landing in Palm Springs, which I will detail below, I was the first one off the plane and a TV reporter stuck a microphone in front of my face. As the cameras were rolling, he asked me what happened and how it must have been harrowing. When I said "American did a very good job of keeping the calm and getting us on the ground safely," he immediately ignored me and went to the next passenger, I'm sure hoping the guy would say how his life passed before his eyes and he wrote a teary good-bye note to his family. I do have the picture of our plane on the front page of the "Desert Sun," but it was only a nose gear not locked in place-even if it collapsed it would probably just scrape along with a lot of sparks and in the unlikely event of a fire, it would be extinguished immediately by the fire trucks. The other five emergency landings were a flap "irregularity" on an Eastern DC-8 out of Miami in 1969. I have no idea how much of a problem it was, as the plane was vibrating more than usual, but we turned around and made it back in one piece. Another time we took off from Newark for a trip ironically called "a cruise to nowhere" on an Eastern Airbus headed for a cruise at sea from Miami with no port calls. The landing gear would not go up, so we landed at JFK even after taking off from Newark, probably because the runways are longer at JFK. There was a raging snowstorm and, thinking we were lucky to have taken off at all, got stuck for 8 hours at the airport, instead of going to Florida for a nice cruise. Yes, it surely was a trip to "nowhere." I have flown on 577 American Airlines flights in my life, and I like to kid AA that on my very first one from JFK to Dallas on a 727 we had to make an emergency landing in Indianapolis. They had just put a nice steak in front of my wine in seat 2A after a nice drink, but had to yank it all away when the pilot said we need to land immediately due to hydraulic problems. I also don't like the word "immediately" when referring to aircraft maneuvers. How serious was it? I'm not sure, but hydraulics are used to steer the plane and control the flaps, rudder, landing gear and stabilizer. I survived, but we had to spend five hours at Indianapolis airport with no food and board a new plane that had not been catered. I missed my connection in Dallas to San Jose, but they did have wine and vodka on the plane so life as we know it continued, and I flew out to my cousins wedding the next day. The two other emergency landings were engine fires, one on a Pan Am 727 to Boston from JFK - I heard a significant "bang", and sounds like something was coming apart. Something was coming apart-our engine, as it spewed metal all over Connecticut. We proceeded to land without further incident on our two good engines. The other was on a TWA 747 to JFK (maybe I should stay away from JFK) from Madrid after an 8 hour delay. We took off at 8PM on a flight scheduled for noon. About five minutes into the flight I could hear an engine spooling down. They had a fire waring signal in the cockpit, so we got an extra day to drink Spanish wine at Boutin's, a famous restaurant in Madrid that we had just told our waiter, "we'll be back soon." There was one other flight that day to New York on Iberia, and that plane also had to make an emergency landing! This could only happen on Iberia - I am not kidding, a horse got loose in the cargo compartment and obviously did not like his coach seating arrangement. I can only imagine being on the plane, climbing out and hearing Neigh, Neigh, Neigh! Hi-Yo Silver, Away! Thump, Thump, Thumpity, Thump. The story was in the Wall Street Journal the next day. On my Palm Springs flight we were approaching the airport from the south when the pilot turned the plane left, away from the airport. Most didn't notice, but I did. We were dumping fuel to be lighter when we landed - the nose gear had come down but they did not get the normal green light indicating it was locked in place. The Santa Anna winds were in full force and the plane was rocked with turbulence-a lot of people got sick, and were very very nervous. In emergency landings, it is common for the flight attendant to pick a passenger who looks able to take over in case she/he is incapacitated. She picked yours truly, a truly great choice. She went over the entire safety briefing with me including use of the slides, and asked if I had any questions. Yes, if the landing gear does not collapse we won't need the slide, right? Right. And if it does collapse, we won't need it then either as we'll be on the ground, right? She mentioned something about me being a wise guy. They tell you to take the brace position way too early in my opinion, about a minute before touchdown. But I suppose some people just don't listen. I waited until the last minute as I thought maybe I could tell something from the planes shadow about the gear-she yelled at me to get down and "brace, brace, brace" but not much could happen to the landing gear if we were still in the air, right? I got another "wise guy"comment. I did yell out toward the cockpit to be careful, as my golf clubs were in the cargo hold, figuring it would lighten people's mood-did I hear something said about wise guy again? We were told that a pin needed to be put in the gear to keep it in place and we would be towed in. I guess life in Palm Springs is pretty placid as they made it a front page story the next day in the paper and it was on the TV news that evening, but without the wise guy who said that American did a good job getting us down safely. It's just as well because my boss did not know I was in Palm Springs playing golf. I have been on planes struck by lighting three times, once near DC, once approaching Tokyo where the poor Japan Airlines flight attendant jumped about two feet in the air, and lastly out of Atlanta on Delta in 2013, which was a stronger shake and bang then the others, and I even saw the flash. The pilot came on said lighting hit "something in the area" - really? I think that something was our plane! It shook people up but there is virtually no danger to the flight as the plane is made to have the electricity spread out and dissipate through the skin of the aircraft. Here are a few more stories that will be detailed in my book "Thrilling Adventures in a Life of Travel." I flew through a hailstorm on a United 747 climbing out of 20,000 in a thunderstorm. It was so loud I couldn't hear the person next to me as it sounded like a giant was throwing rocks against the fuselage, or a near miss with another plane out of Sacramento that was so close I still shutter thinking about it, seeing the other pilot clearly and missing almost head on by less than 50-100 feet. How about a trip where I had an aborted take-off, an aborted landing, a cancelled flight, and a hotel room without a bed? Or my father, an Eastern Airlines Captain who had his number one engine explode on take off from Atlanta in an uncontained failure (the pieces of engine blew out all over the town of Hapeville) on his way to San Juan with a full load on a hot day, both of which affect performance in the negative. The tower told him he had 100 feet of flames coming out of what was left of the engine. Imagine being a passenger seated in back of the wing, a loud explosion, the plane shaking and vibrating like crazy, and 100 feet of flames spewing out of the engine right in front of you. Travel is such an adventure! It was a regular day in March, on a milk run shuttle flight from Newark to Boston, Eastern Airlines flight 1320. At the controls was Captain Bob Wilber, a good friend of my father’s, a fellow Eastern pilot who visited us often to play golf. Many years later, his arms still show two large scars from his hands to his elbows, a lasting reminder of multiple gunshot wounds he survived. Normally, gunshot wounds to the arms would not put you in grave danger. Not unless you happen to be the captain of a commercial flight at 5,000 feet altitude after your co-pilot was mortally wounded and a hijacker was in the cockpit with a gun intent on killing you and crashing your airplane. This was the situation Captain Wilber faced on St. Patrick’s Day, Tuesday, March 17, 1970. He then made his intentions clear that he wanted the pilots to fly until they ran out of fuel and crash the plane, so the co-pilot, James Hartley, grabbed for the gun and a struggled ensued. Hartley was shot in the chest, mortally wounding him and he collapsed. DiVivo then shot Captain Wilber in each arm, causing him to bleed profusely. Even in his critical situation, Hartley suddenly arose and was able to wrestle the gun away from DiVivo and shoot him three times before relapsing into unconsciousness. But it was not enough. Although wounded and slumped between the two pilots, Divivo arose after passing out and began crawling at Captain Wilber, attempting to force a crash. The gun had fallen on the center console and Wilber was able to retrieve it and hit DeVivo over the head, finally knocking him unconscious for good. Hartley had died from his wounds, and Divivo was slumped over, hampering Wilber’s ability to fly the plane. It is amazing how some people can overcome almost impossible odds in a critical situation. Wilber was bleeding profusely and his arms severely damaged and weakened by the bullets, with one slug remaining in his arm. Despite his severe injuries, he managed to remain conscious, declare an emergency with ATC and land the plane safely at Logan. A reporter at Boston.com said, “that was one hell of a piece of flying," an understatement if there ever was one. Once on the ground, Wilber keyed the mic and said to the tower “My pilot is shot-shot. Where the hell do you want me to park this thing?” He never mentioned that he was shot. Wilber had extensive damage to his arms with tendons and muscles severed and much loss of blood. He spent almost a month in the hospital. Devivo was immediately arrested and eventually hung himself with a necktie in his jail cell awaiting trial. Other than some major scarring, Wilber regained use of his hands and arms over time, and I can attest to the fact that he could hit a golf ball pretty well when I played with Bob and my father years later. Bob Wilber is retired now and lives in Florida– he said “I don’t think about the flight that often” “But when I do think about it, I think about Jim Hartley, he was absolutely a hero.” Eastern renamed their training center in Miami “The James Hartley Training Center” and installed a bronze plaque detailing his heroism. We throw around the word hero frequently today, and it has lost some of the original meaning. But Bob Wilber and his co-pilot, James Hartley, were truly real heroes.